Founded on September 4, 1922, in Blackpool, United Kingdom, Jaguar has an almost one-hundred-year-old history. And when you invest in a Jaguar, you don’t only buy into the culture and heritage. You become a proud owner of a remarkable car made by one of the world’s most prestigious automakers. Today, we will take a closer look at another special car manufactured by Jaguar: the 1953 Jaguar XK-120. This is one of the models we at Corsia Logistics have shipped in the past. And let’s just say those images of XK-120 are still quite vivid in our memory. 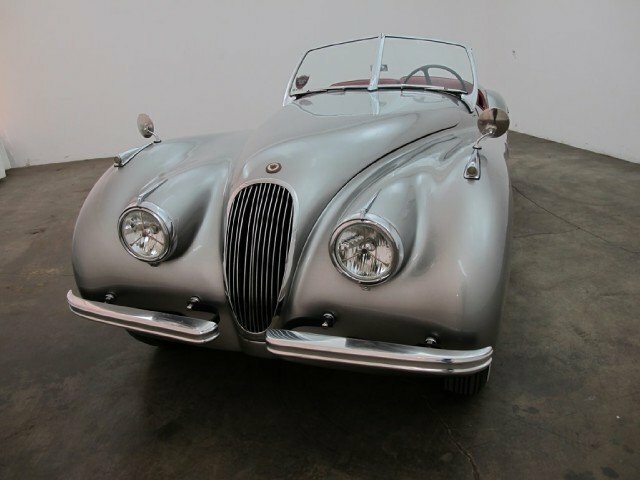 We will offer you a glimpse into the history of Jaguar car manufacturer and the 1950s period in the auto industry in general, so we can see how trends of that era influenced the XK-120. And finally, we will share some tips on how you can ship a car like this to a place of your choosing, in perfect condition. Without further ado, let’s get started. Jaguar, the luxury vehicle brand of Jaguar Land Rover, was founded as Swallow Sidecar Company (S. S. Cars). Before developing passenger cars, the British multinational car manufacturer made motorcycle sidecars. After the World War II, in 1945, the company changed its name from S. S. Cars to Jaguar Cars Limited, so that its previous ‘SS’ would not be associated with the WWII Nazi SS in any way. All S. S. Cars shareholders agreed to change the name at the time, and we’re glad they did. During the last century, Jaguar has introduced many automobile models that have evolved over time. The XK120, in particular, was a breakthrough for the company and sports cars in general. Manufactured from 1948 to 1954, the model was the first car introduced by Jaguar since SS 100. The engine of the car was designed by Claude Baily, William Heynes, and Walter Hassan. Similar to Mark V, the XK120 was powered by a 3.5-liter hemi-head six-cylinder motor. The engine had a wheelbase of 102 in, a length of 173 in, a width of 61.5 in, and a height of 52.5 in. Do you know how many cars of this open 2-seater were made? 12,055! Anyone should be lucky to have one. The XK120 first appeared as an open two-seater at the London Motor Show in 1948. The car on display was the very first prototype. It looked almost exactly the same as the vehicles that were produced later. The only difference was the outer pillars of its windscreen which were not straight but curved on the production version. As with every car manufacturer, before launching a new model, Jaguar hesitated. The company felt uncertain about the new model’s success. Lucky for everybody, the sports car made a great impression at the show and this, in a way, persuaded Jaguar’s Founder and Chairman, William Lyons, to put the XK 120 into production. Also, all two-seaters were available both with left- and right-hand drive. When it comes to car culture, the fifties had a long-lasting effect. After the end of World War II, a boom of innovations spread in fashion, consumer goods, and music areas. The automobile industry didn’t stay behind either. In the 1950s, the auto industry saw great changes in design and safety as well. During the same time, the production of automobiles soared. And what made cars of that epoch so special was their peculiar design. So to this day, we continue to cherish the 1950s models. In the US, the 1950s paved the way for car culture explosion. The vehicles of that time had a very distinct look. After the grim days of was, people looked forward to adding more color in their lives. Hence, pastel shades of blue, pink, and green became popular. In the advent of the Space Age, it wasn’t unusual to see cars that resembled rockets. Large tailfins, body with chrome detail, and a flowing design – all became an intrinsic part of the 1950s car look. Elaborate taillights, wrap-around windshields, and hood ornaments accounted for other distinctive features. Once luxury – power steering, power brakes, and automatic transmission became more accessible. Throughout the years, Jaguar has been loyal to a classic design that is so loved by thousands of enthusiasts from all over the world. The 1953 Jaguar XK-120 is the epitome of that. It is so much more than just a luxury car. It is a dream. Just look at it! Its style, elegance, and all the history behind it make it so special. As I mentioned earlier, all cars produced from 1953 were called Drophead coupé (DHC). 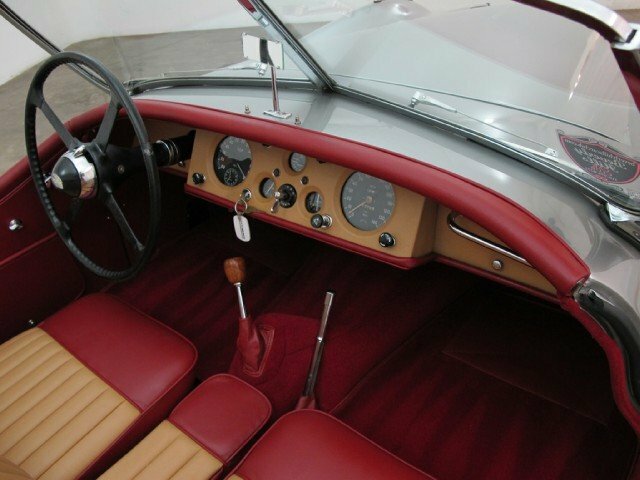 Available in both left- and right-hand drive, the XK 120, unlike other luxurious cars of the time, had wind-up windows and wood veneer on the dashboard and interior door caps. The same applied to Fixed head coupés that were produced from 1951. By the way, do you know what “120” in XK120 represents? Doesn’t ring a bell? The number 120 referred to its 120 mph top speed, which made Jaguar the fastest standard production car in the world at the time. If the windscreen would be removed, the Jaguar XK120 could reach an even higher speed. To meet the mass production demand, Jaguar had to equip the XK120 (starting with the 1950 model) with pressed-steel bodies. Nevertheless, it continued to retain its aluminum doors, bonnet, and boot lid. We know how important any car is to its owner. We also understand how, for many people, their car has sentimental value and may even represent a part of their identity. That is why finding a vehicle shipping company that will take great care of the car and go the extra mile for its clients, may seem like a daunting and nerve-wracking task. Especially if you have never shipped a car before or have had unfortunate experiences with shipping companies in the past. Don’t fret. Shipping a car is a simple endeavor, once you hire the right company that offers outstanding customer care and fair and realistic prices. Don’t expect the transport of your Jaguar to be inexpensive though. Especially if you choose enclosed auto transport to add extra protection for your car. How to find a reliable auto transporter? Google is your friend in so many cases. And it will be a real help when you need to research auto transport companies to ship your special Jaguar XK 120. Search for “auto transport companies” will return plenty of hits. Look beyond the first pages of Google search results. Pick 3 companies to contact either by calling or sending them an email. But before you do that, read their online reviews to learn about other customers’ experiences. This step will help you avoid wasting time on companies that are not reliable. It is your job to decide for yourself if a company is trustworthy or not. That’s why reviews come in handy. Once you pick those 3 final companies, give them a call, talk to their representatives, and get a real feel for how they treat their potential clients. You would be surprised how much insight you can get by calling and asking questions. What type of transport do Jaguar XK120 owners prefer? The answer is enclosed auto transport. The main reason why most Jaguar owners go with enclosed auto transport because it protects precious vehicles from any external factors. Luxury cars like Jaguar are expensive and require extra care, especially when transported between states or even countries. Here is a great guide about shipping a Jaguar to another state. A reputable auto transport company such as Corsia Logistics knows how to handle high-end vehicles and has experienced shipping high-value cars like 1953 Jaguar XK 120. We will be happy to talk with you if you have any questions regarding the shipping process, shipping costs, or any other auto transport concerns. Thank you!